It was 104 years ago today. In the early morning hours of Friday, 29 May 1914, a thick fog rolled into the St. Lawrence River near Pointe-au-Père, Quebec. It cut visibility on the river to essentially nothing. Now… think for a minute. You’re a genealogist. And a research subject was on board one of those ships. Or related to someone who was. Wouldn’t you just love to have the kind of detail set out above to add to the richness and depth of the story you’re telling? Because just about everything set out above comes from, or can be found in, that report. In this particular case, it’s the Report and Evidence of the Commission of Inquiry into the Loss of the British Steamship “Empress of Ireland”… Through Collision with the Norwegian Steamship “Storstad.” Quebec, June 1914. It was published in 1914 by the Canadian public printer, and then reprinted in its entirety in volume 16 of the 1915 Sessional Papers of the Dominion of Canada. You can find that volume containing the report digitized on HathiTrust Digital Library — all 615 pages of testimony, arguments and official conclusions. About the only good thing to be said about so many horrible deaths in horrible circumstances is that they tend to produce lots of records. And these are but a few examples of the official inquiry reports that might exist — and the reasons why we definitely should inquire about any Board of Inquiry report for any event our ancestors may have been involved in. Image: Wikimedia Commons, citing Library & Archives Canada. 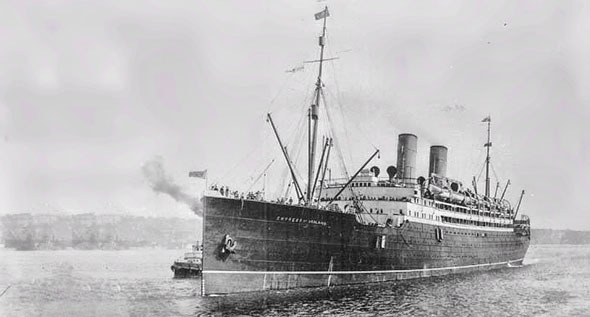 What was the worst maritime disaster? Might it have been the explosion of a munitions ship in Halifax harbor on 6 Dec 1917 during WWI. It killed an estimated 2000 souls and leveled vast parts of the city. This link https://en.wikipedia.org/wiki/Halifax_Explosion describes the event and provides a link to information about the 1,950 known victims: “Halifax Explosion Remembrance Book”. Public Archives of Nova Scotia. 26 November 2009. My mother’s merchant marine cousin, David Davis Stuart, was wounded in a Japanese attack on the MV Donerail to cover their retreat from Pearl Harbor. The technical details are described at http://www.usmm.org/donerail.html. There were 24 survivors who made it into a shot up lifeboat. Only 8 survived the 38 days they floated until their fortuitous rescue. They did not reach civilization (Fiji) to tell their story until March 1942. It was an epic tale of survival at sea, told to reporters in a source familiar to genealogists: https://www.newspapers.com/image/160309944/. Unfortunately, David Stuart died on the lifeboat on 15 Dec, a date conveyed by the survivors when they visited his mother to bring her closure. Sailor, merchant marines and navies keep detailed records that tell these heart rendering stories of our family members. The Halifax disaster — which I’ve written about (in both A matter of inquiry in 2012, referenced here, and in Remembering Halifax in 2017) — was truly awful, but no. Not even close to being the worst for loss of life. That dubious “honor” belongs to the sinking of the Philippines ferry MV Doña Paz in 1987, with 4,341 deaths and only 24 survivors.